Trumbo is presented along with local author Laura Kalpakian’s release of her new novel The Great Pretenders and will feature a reading from the book and a Q&A with Laura before the film. In 1947, Dalton Trumbo (Bryan Cranston) was Hollywood's top screenwriter until he and other artists were jailed and blacklisted for their political beliefs. 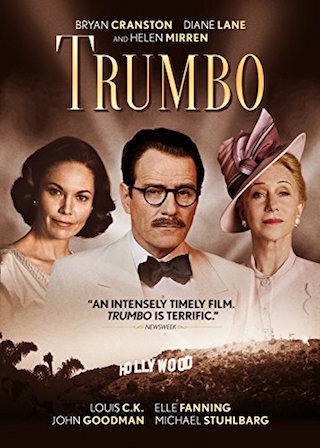 Trumbo (directed by Jay Roach) recounts how Dalton used words and wit to win two Academy Awards and expose the absurdity and injustice of the blacklist, which entangled everyone from gossip columnist Hedda Hopper (Helen Mirren) to John Wayne, Kirk Douglas and Otto Preminger. Laura Kalpakian is the author of sixteen novels and four collections of short fiction published in the US and the UK. Recipient of a National Endowment for the Arts Fellowship in Fiction, and nominated for the 2007 International IMPAC Dublin Literary Award, her work has garnered acclaim on both sides of the Atlantic.